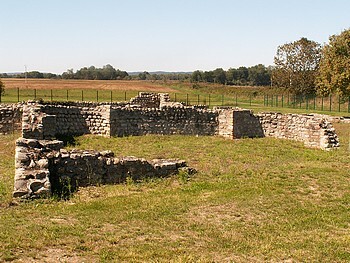 The archeological site of Valentine. The originality and the interest of the archeological site of Valentine are the ruins dating from the IVth to the XIIIth century. •	Some necropolis form the Late Empire to the end of the XIIIth century. From 1949 to 1981, some local volunteers headed by Georges FOUET, in charge of research at the CNRS (National Center of Scientific Research) and the "discoverer" of the Villa of Montmaurin, cleared this site that copses had never completely overshadowed. Unfortunately, the north of the villa (with the exception of a mosaic) was destroyed by the building of a canal, in the 30s. 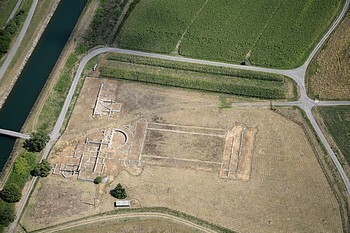 The Villa, facing south, is built above the mist of the Garonne, in the heart of a fertile area, in accordance with the Latin architects' and agronomists' orders, near the roman road from Toulouse to Saint-Bertrand de Comminges then called Lugdunum Convenarum. One part of this road passes between the Temple and the Villa. Only about sixty rooms remain from the "Villa Urbana", the owner's house. But the villa had two or three times more. The plan of the Villa, like for all the Villas, comes from the plan of the Greco-roman house and juxtaposes on only one level around a central courtyard of 33.50m.square surrounded by peristyles, reception and ceremonial chambers and private apartments. The main courtyard 52m long by 21.45m wide surrounded by porticos, led to the Nymphee by a gallery. 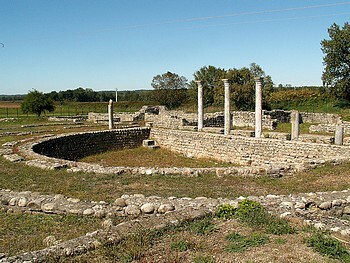 A peristyle also surrounds the swimming pool of the Nymphee with a roof supported by twelve columns with toscan capitals. The water came by way of an aqueduc, which harnessed thermal spring water from the neighboring village of Labarthe de Rivière. The waters left the Villa by marble overflow in the shape of a lion's face, then flowing on down thru the gardens to a small port on the river, where an "épissoir" (large needle) made from the antlers of a big stag was formed. It is believed that this tool was used for making splices and rope work. There is still some marble paneling visible on the walls made with big pebbles from the Garonne. The corners of the masonry work were built with local well-squared limestone rubbles. Eleven rooms were covered with mosaics. In particular room 25 in the east side of the Villa. The other rooms had marble paving, generally from Saint-Béat. There were some frescos with vivid colors and geometric shapes on the walls. The less important rooms were whitewashed and their floor was paved with limestone or with clay bricks. Quite a few "hypocaustes" have been discovered. This is a heating system using warm air through the floor and walls. The "hypocaustes" of room 26 is built with radiant flues, fed by three fireplaces and its dimensions are remarkable: 14m by 9.60m. The main lounge, 9.60m square, has in the corners some apses, may be the support of a dome. 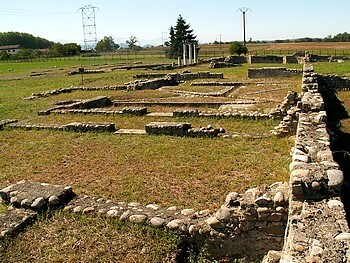 Will some excavations allow us to find the "Villa Rustica" (the outbuildings) always present near the "Villa Urbana"? To the west of the main courtyard some therms were recognized in 1864-65. We can see them now by aerial photos. 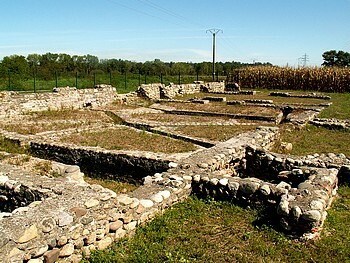 On the other side of the roman road, a temple 34.45m by 29.70m completed the entity. It was dedicated to Jupiter, very great and very good, and to Bouccus a local rural deity whose presence is an example of the gallo-roman religious syncretism. A mausoleum of the IVth century has been discovered on the eastern edge of the Temple. It was Nymfius' tomb. He was probably the owner of the Villa. His epitaph when found showed he had important functions in his province. This mausoleum of 7m by 6m with an addition of a rectangular chevet became a little church (one of the oldest in Gaule) in the IVth century. We can find a marble four petaled rosette plant-like stylization used in gallo-roman marble from the Pyrénées. During this period as the church was being burned, blazing beams fell on the already damaged marble and the sarcophagus. During the VIth and VIIth centuries, another little church was built fifteen meters from the paleochristian church. This church was enlarged at the Carolingian era to form a sanctuary of 10m by 5m. These religious buildings were surrounded by necropolis where excavations have led to the discovery of some Gallo-roman cinerary chests, a cemetery of babies buried in amphoras, some sarcophagus, a wisigotic tomb from the Vth century and some contemporary tombs of the last two buildings: the church of the IXth and Xth centuries and the church of the XIth and XIIth centuries. The preromanesque church, facing east like the other churches of the site, had a quadrangular chevet and some mosaics, the mosaic of the entrance have been recovered. The Roman church built on the site of the XIth and XIIth centuries church, was 30m long by 10m wide from the round chevet to the steeple-wall consecrated to the Virgin, this church adjoined the other buildings of a Benedictine priory, the priory of Arnesp. It was dependant of the Abbey of Lezat in Ariège and was the parish church for the local people until the foundation of the walled-town of Valentine (in 1284) and the building of a new church in the village. The priory was extended beyond the road D8, built during the XVIIIth century by the Intendant d’Etigny. The site of Arnesp, (just south west of the Valentine site) progressively abandoned became a haunt of robbers, a bad site, in the local tradition. The ruins were pulled down in the XVIIIth century and the site became a quarry with the materials being used for building in the village, notably for the rebuilding of the church which kept the Nymfius' epitaph for a long time in one of its walls. 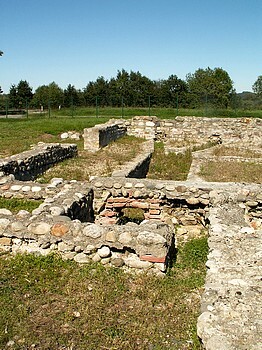 In addition to the marble, the excavations have enabled us to find some votive altars, some elements of sigillated dishes, some coins, funeral furniture from the VIth and VIIth centuries: buckles, bronze "fibules", shells and steel-tipped canes of pilgrims of Saint-Jean de Compostelle who died in this area. A lot of vases, from the first centuries of the Middle Age, have been found in pits for either offertory or waste. These findings are stored at the excavation warehouse created by the "Ministère des Affaires Culturelles", the "Consul General", the commune and some volunteers from Valentine. The site of Valentine is listed as a historical building and as such is an area of our past. G.Fouet's interpretations were questionned very early. 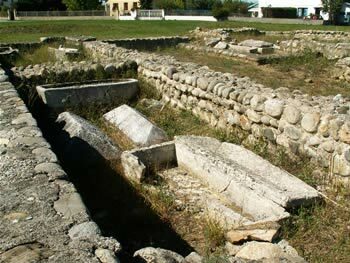 Excavations of confirmation carried out in 2002 to the south of the Roman way under the direction of Mrs. Colin of the D.R.A.C Midi-Pyrénées revealed their brittleness. The conclusions of the excavation campaign call partially into question the ideas of Georges Fouet. The big building with central courtyard is contemporary of the villa. But this is probably not a temple because ancient Romans never buried their Dead in such an environment. Mrs Colin regards it as the mausoleum of Nymfius. The small building upset by trapezoidal sarcophagi and later tombs is not a church but could have rather had an agricultural use. Under the Romanesque church of the XIIth century, was a large church with a square choir flanked of two also square apses. The chuch is more ancient than Georges Fouet thought. Mrs Colin dates this church from the end of the VIIth century or from the beginning of the VIIIth century and brings it closer to the wisigothic churches built at the same time on the southern slope of the Pyrenees.